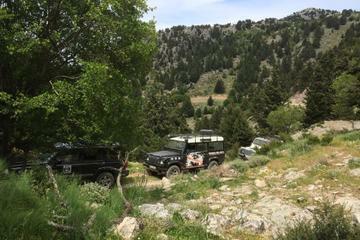 Hop in a Land Rover and let it take you on a culinary and cultural journey through Crete. This Greek island is renowned for its wine and olive oil. On this full-day guided tour from Chania, see how olives are harvested and turned into extra-virgin olive oil. Visit an olive mill and check out a 3,000-year-old olive tree. Sip wine while touring a vineyard. Commune with sheep and goats while making your way around the island in the Land Rover before visiting a 16th-century house where youll learn all about Cretan knife production. Finally, enjoy a typical Cretan meal in a small tavern. Safaris arent just for gawking at exotic animals. On Crete, a safari is much more intoxicating. After being picked up in a Land Rover at your hotel in Chania, take a full-day guided tour through a landscape decorated with olive trees and vineyards. This is a tour filled with wine, food and fun. Expect to come away with a thorough knowledge of Cretes culinary and cultural history. Stop by an olive oil mill to learn from your guide about how olives are harvested to make extra-virgin olive oil. Youll even see a 3,000-year-old olive tree. Moving from olives to grapes, take a tour of a vineyard and taste the wine while learning about the ancient Cretan methods of wine-making. Sit down in a small tavern and enjoy a typical Cretan meal. The cuisine of Crete is renowned for its life-giving, longevity-producing qualities. Expect fresh herbs and greens, seafood, feta cheese, and maybe even savory pies. On the way to a 16th-century house to learn about the ancient Cretan art of knife-making, stop by the chapel of Agia Paraskevi, set above a huge cave. The cave, 525 feet (160 m) deep and 118 feet (36 m) wide, was a shrine to an ancient fertility goddess long before the church was built. At the conclusion of your tour, youll be dropped back at your hotel.